22 04 2009 - BAGHDAD, Iraq (CNN) - Mobile phone use is nearly universal in Iraq. However, the country is served by various phone networks, resulting in a "bit of comical" situation - many residents carry at least two phones from separate providers to ensure that they are always connected. 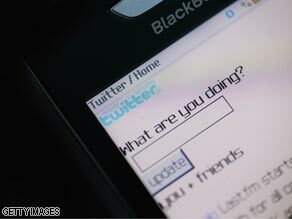 Executives from Twitter are among the social networking experts heading for Iraq. "Can't wait to hear how Iraqis might embrace the potential of the people's internet in a 21st century democracy ... that's why we're here," said a Twitter post from Scott Heiferman, co-founder of Meetup, a social networking service that connects people with common interests so they meet face-to-face. So said Raanan Bar-Cohen, one of nine technology executives who begin their third day in Iraq on Tuesday as part of a U.S. State Department-led trip on how the war-battered country can effectively use new media as it rebuilds. Bar-Cohen represents Automattic, best known for the blog-publishing application WordPress. Accompanying him on the four-day jaunt are Jack Dorsey, the founder of the micro-blogging site Twitter, and executives from Google, AT&T, YouTube and others. The delegation is meeting with officials from public and private sectors in Iraq to "build upon anti-corruption efforts, promote critical thinking in the classroom, and scale-up civil society" among other goals, the State Department said. He and several members of the delegation are posting their thoughts and photos on blogs and on Twitter. Some, like those from Twitter's Dorsey, are quick observations: "The embassy has yoga classes. And belly dancing," read one of his posts, referring to the U.S. Embassy in Baghdad. Bar-Cohen, on the other hand, is posting detailed daily updates on his personal Web site, raanan.com, that speak about the challenges Iraq faces. Five percent of the country has Internet access at home, but a larger unknown percentage of Iraqis get online at Internet cafes, he wrote. Because of the ubiquity of mobile phones, text messaging is very popular. "There is also a ton of SMS (short message service) usage here, which is encouraging as it may provide an alternative means of interacting with certain services as Iraqis wait for internet broadband (to) develop," Bar-Cohen wrote. The country is working to improve Internet connections, but efforts have been hampered by "sabotage missions which disrupt the work" and other factors, he said. "The optimistic projections are for Iraq to be at around 60 percent broadband penetration in about 18-24 months if things go according to plan," he wrote. Bar-Cohen could not be reached for comment early Tuesday but the Web community can follow the delegation's Twitter posts by searching ".IraqTech" on the site. The delegation is the latest State Department effort to use new media and social networking tools to further its diplomatic goals. Secretary of State Hillary Rodham Clinton is already blogging on the State Department's Web site and has an "ask the secretary" initiative, in which anyone around the world can communicate with her directly.